Beauty Garden Organic Facial Fluid moisturizes and detoxifies your skin for a absolute comfort ! Fragrance-free, its light texture allows for easy application and rapid absorption for intense hydration. Rich in extracts of wild thought, it is known for its purifying action that will eliminate toxins from the skin. 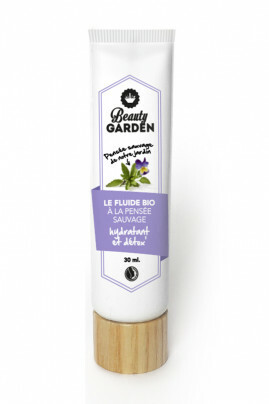 Beauty Garden Wild Pansy Detox Fluid leaves the skin soft, fresh with a radiant complexion ! BEAUTY GARDEN Organic Face Detox Fluid BEAUTY GARDEN is perfect for a radiant skin ! On perfectly cleansed skin, apply the detox fluid morning and/or evening on face and neck. To consume within 9 months after opening the tube. INCI : Aqua (Water), Helianthus annuus (Sunflower) seed oil*, Theobroma cacao (Cocoa) seed butter* Glycerin, Cetearyl olivate, Sorbitan olivate, Prunus domestica seed extract, Glyceryl stearate, Viola tricolor extract*, Microcrystalline cellulose, Gluconolactone, Xanthan gum, Sodium benzoate, Sodium dehydroacetate, Potassium sorbate, Tocopherol.